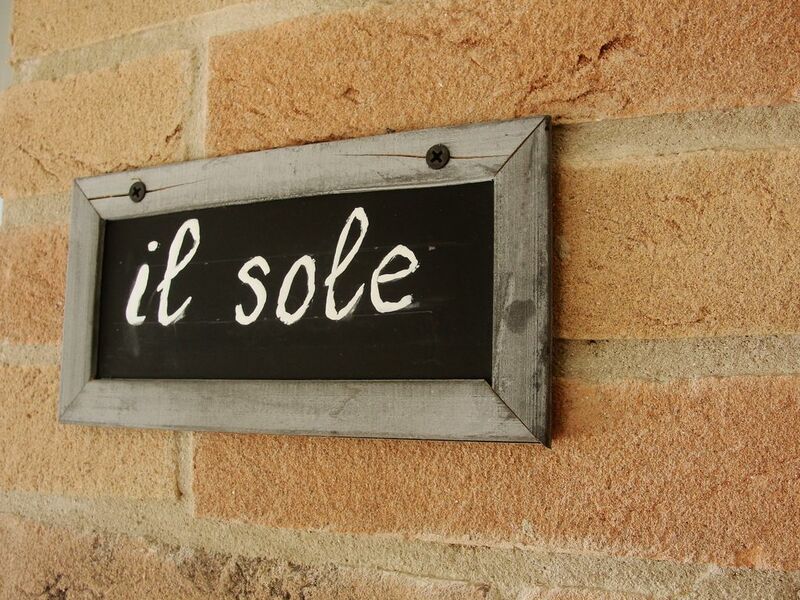 Il Sole is a spacious apartment / house that can accommodate 4 people. On the upper floor is view: 1 large bedroom with double bed, equipped with air conditioning / heating, 1 small bedroom with 2 single beds, which possibly. can be put together into 1 large bed, equipped with air conditioning / heating. Bed linen is provided. On the ground floor is located: the bathroom equipped with double sink / toilet / shower, hairdryer, towels are provided, the living room / kitchen equipped with TV / DVD player, comfortable sofa and a fully equipped kitchen with 4 burner gas stove / microwave / refrigerator + freezer / coffee maker / italian mokkakan / dolce gusto and all the necessary crockery, kitchen towels, dish cloth and dishwashing liquid, table and chairs. This room is also equipped with air conditioning / heating. The covered terrace of 15 m² is equipped with table and chairs. A welcome drink is offered on arrival. We also have a pool of 5x10 with free sun loungers, ping pong table, various board games and DVDs. There is also the possibility to obtain breakfast baskets and we also provide a bread service in the mornings. Once a week you can join for an Italian meal. There is also a barbeque that guests can use. We also have a bar where you can drink a soft drink, wine or aperitif ..... and not to mention free wifi on the entire domain. We also like to give you tips about the area! Numerous restaurants are nearby and also some supermarkets in the near vicinity. Pets are not allowed. There is the possibility to add an extra bed to the master bedroom, subject to supplement.